Next weekend we're headed to Long Island to skate in the first ever New York State roller derby tournament... the Empire Skate Showdown!! It's an all day event hosted by the Long Island Roller Rebels. Eight leagues from NY will be there. This is the first tournament I have ever skated in, but not the first tournament I've attended (Nationals, East Coast Extravaganza). One thing I'm excited about is the bus ride down to the Island with the league. Besides the fact that it's going to be super early in the morning, I'm sure there will be shenanigans. I'm also excited about the tournament because a few of my college friends who live in the City are going to come and check it out. And afterward, I'll be spending the weekend in the City with them and Mr. T. Only my friend Liz has seen me play so far. I think the best thing, however, will be meeting new derby girls from near and far across the State. It's like we're all in one big club and this is a great chance to meet other people with the same interest. We've got two more practices 'til the big day. Time to get rolling! It's official. It only took 6.5 months*. It's Short Temper. Within the derby community, we have an International Rollergirls' Master Roster, informally called "Two Evils" as that's the name of the site it's hosted on. This is so there are not 50 "Punky Bruiser"s or "Lady Gagya"s skating around. Also, if you come up with an awesome name, you don't want people to straight up copy you! When you think of a name, you can check it for uniqueness on the Two Evils website. For example, search "Babe Ruthless", and you'll see not only is that exact name taken, but there are several that are someone similar. So time to get creative! I will admit, there is a "Strawberry Short Temper" which pops up if you search for "Short Temper"...but, I did a little research and it turns out she's a referee from the River Valley Roller Girls, a team from Arkansas. I doubt we'll ever run into each other, but if we do, I hope she doesn't beat me up. While my name is official, sadly my number is 10 inches short. It's listed as 4'1" instead of 4'11". Oh well - it will get fixed. Eventually. Do you have a derby name in mind that you thought was unique and original? How does it stack up against Two Evils? *My name was submitted to the database admin people in February. Because they get so many name requests/updates, they're pretty backed up. So it's kind of a big deal when your name becomes "official". So all of a sudden (well, I guess after two successful recruitment nights) we have this new, great, big group of fresh meat!! I love new girls! Actually, it's not just girls... we've got a couple new dudes who've been coming to practice (up-and-coming refs/volunteers.) And some of them have hilarious nicknames, like "Rump Roast". I cracked up when I heard that one. 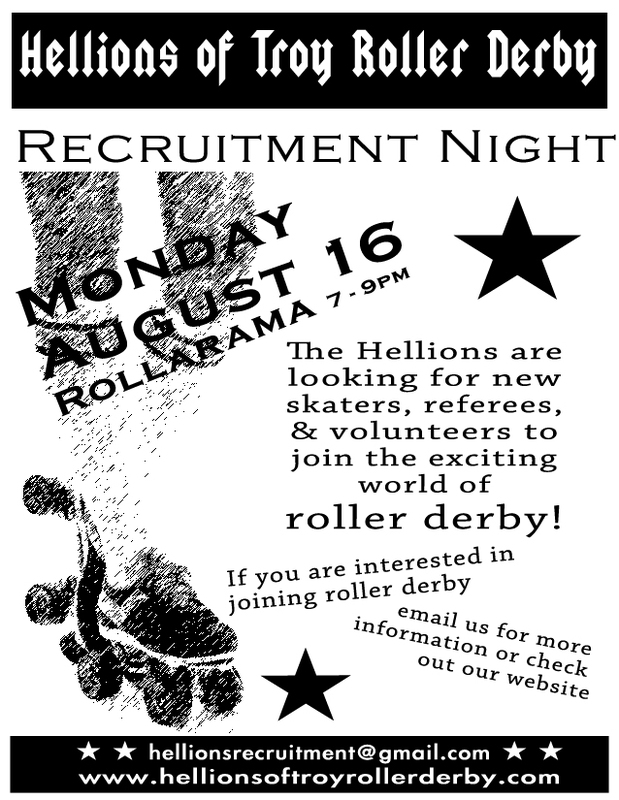 I know any of you that have been thinking of joining, after reading that, totally want to be a Hellion now. Join derby/Get a sweet nick name. You can't really tell from this picture, but at the end of practice, they lined up in front of us vets and did a little dance on their toe stops and demonstrated their newly learned fancy footwork. I worked with a couple girls after practice on t-stops and also swivels. Oh, and sweet news: Mr. T has been coming to derby practice! He's learning how to skate, but he is doing really good. Soon we'll hand him over to Miranda Wrights for some serious referee training. This summer Mr. T and I both got our passports. Last week, we spent a week in Canada and for part of it we were in Toronto. 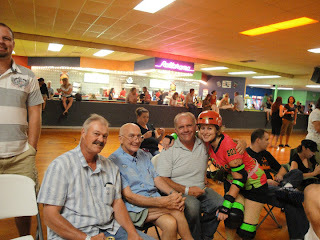 We were lucky enough to catch a Toronto Roller Derby vs. Queen City (Buffalo, NY) game on Saturday night. It was awesome! 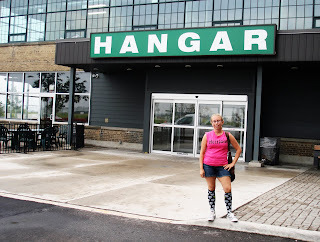 ToRD's space is in what looks like a refurbished airplane hanger (it's also called "The Hanger", so go figure). The event was a double header, with ToRD's upcoming girls (The D-VAS - Deadly Viper Assassination Squad) against Durham Region Roller Derby (also from Canada). They played a shorter game (two 20 minute periods) which was fun to watch - it's great to see new girls working on their skills, especially since I was (am) in "their skates" just so recently. Although evenly matched for the most part, the D-VAS pulled ahead to end the game with a final score of 105-63. Mr. T rocking Hellions gear! But the main event was ToRD vs. Queen City. It was a great match between both league's star teams: ToRD's CN Power vs. Queen City's Lake Effect Furies. Watching them warm up was even entertaining. Both teams had solid warm up drills, and the Furies especially demonstrated their teamwork. One impressive drill was where they all skated single file, and the front skater would call out a skill (plow stop, turn around toe stop, etc) and they would all do it perfectly in unison. Every single girl could plow stop in under ten feet (more like five) - without crashing into the girl in front of her. Tight! The first period they seemed like they would be evenly matched. Up until the end of the first period, the score was within about 5 points, with the lead switching between teams. At the end of the first period, the Lake Effect Furie's were ahead, but not by much. The second period is when the Furies really started to blow things up. Their game play remained tight throughout the period, where CN Power on the other hand seemed to be tiring out. They kept fighting, and still had a few impressive jams. At one point, CN Power had an impressive 15 point jam by one of their star jammers, DefeCaitlin, and the crowd went wild. Soon after, however, the Furies had an equally impressive 15 point, which also made the other half of the crowd go nuts - there were tons of Queen City fans at the bout, too! CN Power seemed to be sending out DefeCaitlin every few jams to try to shorten the gap. If anyone could do it, it would be her. She skated strong all throughout. But it wasn't enough, and the game ended with a score of 110-79 with the Lake Effect Furies on top. One last thing I want to say about the bout was that the two teams played each other with great sports(wo)menship. Opposing jammers chatted as they lined on up; blockers gave and took strong hits and then acknowledged each other for their stamina. You could tell these skaters are in sister leagues. We had an awesome turnout for our last recruitment night. About 10 have been coming back consistently, and quite a few already have their gear. I am impressed!! 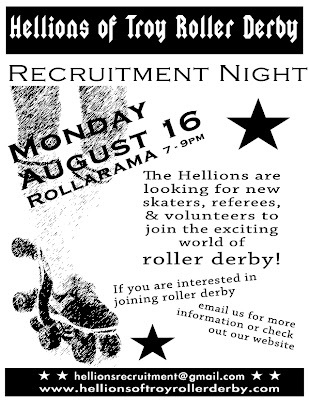 If you missed our last recruitment night, you still have another chance this coming Monday, August 16. Now is definitely the time to join - it's the end of our summer season so you'll have time to learn Derby 101 and prepare at your own pace for joining the veterans on the track. Also, the Hellions LOVE the fall. Our birthday is in September (we'll be turning 3! 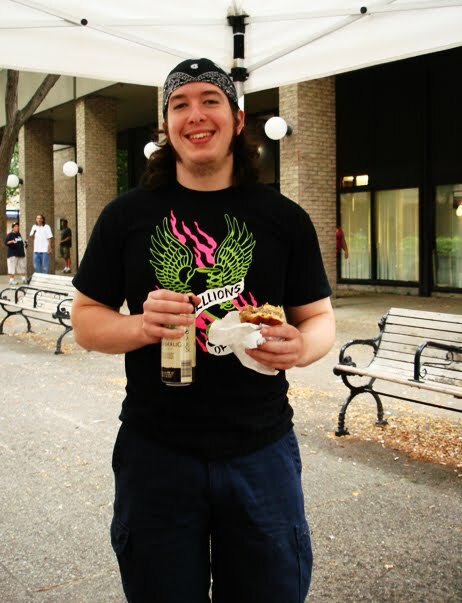 ), plus we've got other fun events scheduled such as the Zombie Walk & Zombie Prom. We'd love to have you join our league! Monday night at practice I fell over one of my teammates who took a spill in front of me. I landed right on my hip bone. Just sayin' - I used to have a few more pounds which translated to a little extra padding. Not so much anymore (I can't really complain about that anymore). So I have a nice fat bruise on my hip. I was so sore on Tuesday, but now I'm feeling better. I'm ready to skate. The week before our last bout and this bout I haven't thought a lot about actually skating though. I'm constantly thinking about one aspect of the bout or another. I know things are being taken care of, and I know I'm not the only fretting about this or that. But that makes me feel a little better because I know someone MUST be thinking of the one thing I forget to make sure is taken care of. I'm neck deep in derby, but I love it. Thursday night at practice I want to refocus on skating. It's two days before the bout. Time to get my mind in the game. Tonight I finally imported the Hellions Music Swap mix to my iTunes. 123 random songs. I shall listen through the entire collection and perhaps note any other outstanding contributions. Hopefully this is a relaxing activity and I can focus on the game and my teammates - vicariously through their music tastes. 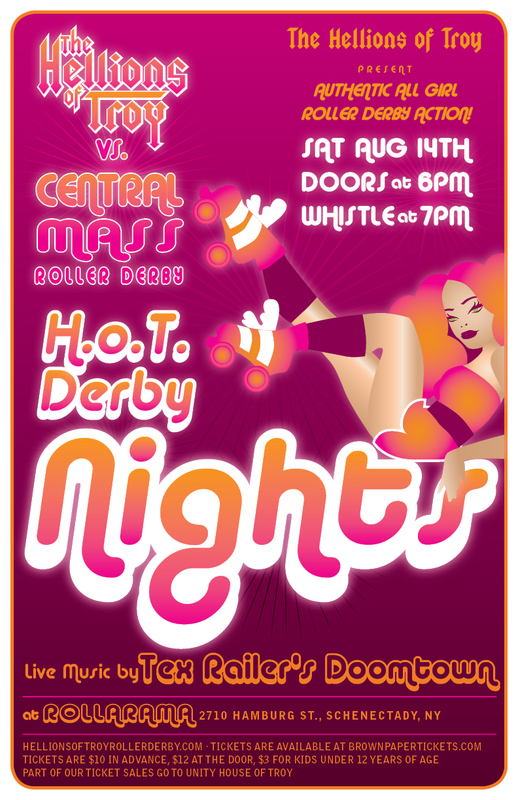 Join us this Saturday when we take on the Central Mass Roller Derby's Petticoat Punishers. Last month we were thrilled to be welcomed back to town by a crowd of over 350 people. We'd love to see you all come out again! This bout is themed "H.o.T. Derby Nights", a playful nod to the disco nights of the 70s! Dress to impress, you know we will! Through the rest of this week, keep an eye on the Hellions facebook page for a chance to win a ticket to the bout. Also, All Over Albany has tickets to give away later this week as well. So be on the look out! Not having a lucky streak? Tickets for the bout are $10 in advance, $12 at the door, and $3 for kids under 12. To avoid finding yourself in a line of devoted fans, tickets are available through www.brownpapertickets.com or from your favorite roller girl. Fans can also bring their own chairs and sit on the side lines, known for the best views in the house! This wasn't the first bout I have ever played in but it was my first home bout. I knew it was going to be a different experience than any of the other times I've played. It was our home turf, the floor we were use to playing on, and for once I wasn't nervous while getting ready. At 6 p.m. the doors opened up and people started to make their way through the door. The rink started to fill up and everyone seemed excited to be there. It was awesome how many fans came to support and cheer on the Hellions but personally I loved how many people were there to cheer me on. I had at least twenty people there if not more who came to see me play and find out what derby was all about. The best part was when I went over to say hi to everyone and realized I had a surprise guest. My stepdads Uncle Bernie was there, all the way from St. Louis, Missouri which was nice because I haven't seen him since I was little. I'm glad I got to share something that has become such a big part of my life with so many members of my family and friends. Around 7 p.m. we finally got started. 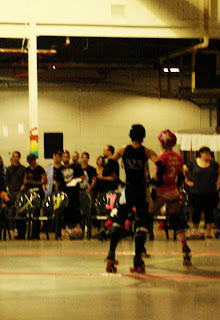 While out on the track Wii Block Her from the ManchVegas Roller Girls was standing behind me and said "Hey, we have the same number". I told her I picked 603 because of my birthday but I wasn't sure why she had picked it and didn't have time to ask because the whistle blew. Every time we were out on the track together became a battle of the numbers but it was fun. 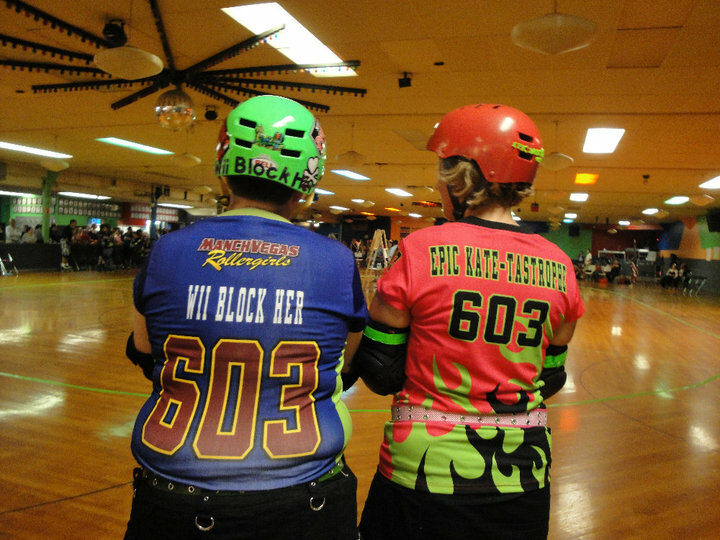 After the bout I found out 603 is the area code in New Hampshire which is where the ManchVegas Roller girls are from. I never thought I would meet a girl with the same number as me but I did. I had an amazing time during this bout. I had a lot of family and friends there supporting me, met another 603, and we won!